Meet the real Spiderman. Les presento al verdadero Spiderman. With All My Heart: Meet the real Spiderman. Les presento al verdadero Spiderman. Meet the real Spiderman. Les presento al verdadero Spiderman. Last week was the annual Scout Summer Camp, we had so much fun cooking for the boys, lots of work but so worthy!!! La semana pasada fue el Campamento Anual de Scouts, nos divertimos mucho cocinando para los muchachos, mucho trabajo pero valio la pena. One of the scouts told me to take this picture of Seth, he was wearing a Spiderman t-shirt. The boys tought Seth was so brave standing so close to this "little" spider, they called him, "The Real Spiderman"
Unos de los Scout me dijo que tomara esta foto de Seth, el estaba usando una playera de Spiderman. Los muchachos pensaron que Seth fue tan valiente al estar tan cerca de la "pequena" arana, que le llamaron "El verdadero Spiderman"
Aqui hay mas fotos, solo tome pocas, estaba muy ocupada en la cocina y en mis ratos libres estaba leyendo un libro o "scrapenado"
This is a terrible picture, it was dark and couldn't take a decent picture, but oooh!! 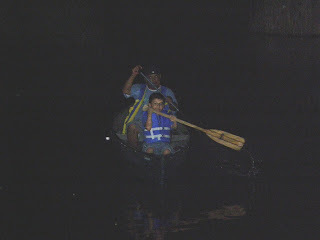 they wanted to canoe at night!!!! esta foto esta malisima, estaba muy oscura y no pude tomar ni una sola foto decente. a pero ellos querian remar en la noche!!! Una de las clases favoritas de los Scouts y porsupuesto de Seth tambien. Two of the leaders, Danny (left) our bishop and Dan (right) Scout Master. They love sitting here everyday, just to talk and admire the view. Dos de los lideres, Danny (izquierda) nuestro obispo y Dan (derecha) El Scout Master. Les encantaba sentarse aqui, solo para platicar y admirar el paisaje. Oh my goodness that spider was huge! Is really funny that he had that Spiderman shirt on though. OMG!!! Tere i would have been crying if I saw that spider,YUCK! It looks like agreat place to stay thou. Glad you got your car back. admiring the view, just a fab photo! Oh, my goodness! That thing is HUGE!! I agree with whoever said they would be crying. I would have balled up in the fetal position too! would die. Me tienen que llamar all 911 si eso me pasa a mi. Seth is one Brave young man.